Localizer Mall is located in Prince Mohammad Bin Abdulaziz Road, As Sulimaniyah District, Riyadh. 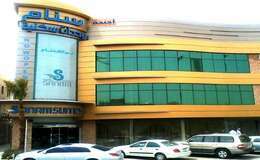 Localizer Mall is one of the most famous commercial centers in the city of Riyadh. It is one of the most successful and distinguished investments made by Khalid Al Shaqri Group and Saad Al Wallan Group. Localizer Mall includes many different and wonderful restaurants, in the second floor there are many offices of different companies. It also include many shops for men's clothing and fashion more than women but it also contains a collection of distinctive stores for women's clothing and children, which are in line with the most famous and the latest fashion world. The second floor, especially the dining corner, has a wonderful view of Tahlia Street. The mall also has a large number of exquisite Arab perfume shops, bags, jewelry and watches, as well as world-class cosmetics shops, In addition to exquisite shoes stores. Localizer Mall includes games hall, which is famous for its various games, as well as sweet shops and children's play areas. It also features a health club First Fitness, In addition to the interactive children's club which is known as In Motion, which makes the Localizer Mall a special place to welcome all visitors.